This weekend saw the inaugural show of the Kansas City Comic Con... and on Saturday I was in attendance. Let's get this out of the way first. I live in and around the Kansas City Metro, and our big annual comic book/pop culture convention is Planet Comicon. Over the past decade I've watched it grow. Bigger, larger. More guests. More venders. New venue. And as a resident comic person, it's nice to see a local show that can grow to compete on a national level (although to be honest, on the news sites I usually visit, I don't really recall seeing any news coverage of Planet Comicon). So what does KCCC bring to the table? A little bit of healthy competition I'd say. I wouldn't call this a clone of Planet Comicon, even though the similarities are there, sure, but I think the business model/structure of the convention is different from Planet's. And it would seem that guests and vendors would benefit from this model, to eventually include the attendees. 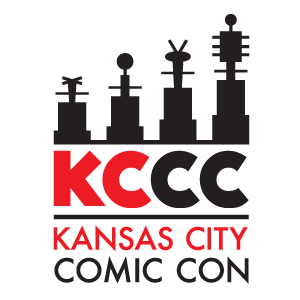 KCCC really swung for the fences with this first show, bringing in some unique attractions, guests, and exclusives. I would say overall the Kansas City Comic Con did a great job. Whatever problems KCCC might have had, they can use it to improve for next year, and I am already looking forward to that show! A good run of guests for this first year. Most of the local crew were in attendance. Walked right onto the con floor and found Ande Parks and CW Cooke right away. Shortly there after I was recognized by a gentlemen who was set up right next to Cooke, artist Joe Corroney. Joe was kind enough to give me a cameo as a member of Starfleet in an issue of Star Trek, and as a Trekkie... that's just beyond awesome. It's always nice to be able to thank an artist in person. Glad I was able to with Joe. Moving along I found Kevin Mellon and Dennis Hopeless chatting it up with Matt Fox. Matt had recently drawn me into Ufology from Boom! Made sure to stop by his table to thank him and pick up his latest graphic novel. Meet artist Kevin Nolan. He was nice to chat to and handed me a folder of recent sketches to go through. Ran into a few Free State Con regulars including show runner Craig, along with creators Mario Mora, Bill Hook, and Mike Sullivan. Always good to chat with them. 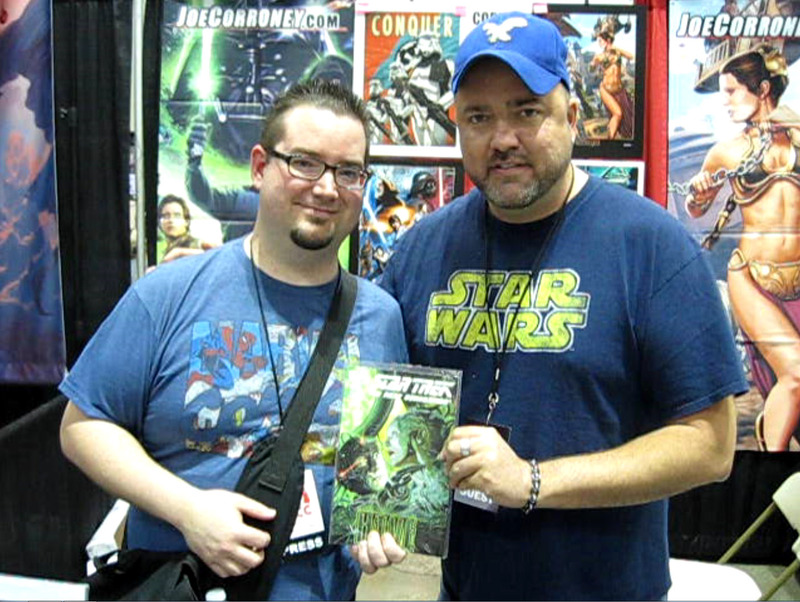 Talked to a few guests from out of town; Mike McKone, Tom Raney, and Brett Weldele. Gave them each flyers (of course). Grabbed a few autographs from Jason Aaron and Jeremy Haun. Stopped by Leeanne Krecic's table. 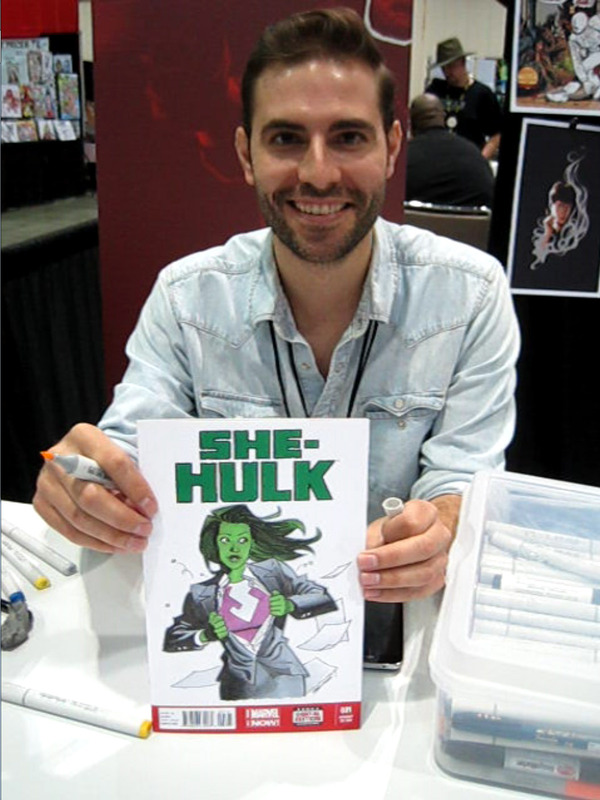 She mostly draws in a manga style, but I couldn't help notice her more recent western/american comic book work. Regretted not picking up something from her at Planet earlier this year. Did not repeat said mistake. And finally ran into this guy pictured below. He draws stuff. Artist Greg Smallwood working on a commission. BTW Thanks man. You know why. No figures this time around, just prints and books... supporting the cause and all. I look forward to the day I can have all of these properly framed, and hung on the wall in a new "man cave". Almost all items are from local folks. Exception being the Star Trek print by Joe Corroney, the cover from the issue he graciously gave me a cameo in. Also of note is the acquisition of my first Daredevil comics. Don't get me wrong, I've read a few of his classic stories thanks to a friend lending me trades. Hell, I've even read these issues in trade, but I'm a single issue guy, and so I figured to start with the Smith/Quesada/Palmiotti run. Appearance #55! UFOlogy #3 by Matt Fox!